Michael Block, Managing Director at Third Seven Advisors, explains how illiquidity and passive investing will lead to positive momentum in the tech sector. He discusses how to take advantage of the opportunity in this interview with Brian Price. Filmed on September 4, 2018. Excellent. Learned a lot in short interview. Hard to beat that! Really good ! It's really important to understand how institutional order flow has changed over the past 10 years. Michael's explanation is spot on. This guy keeps it real. Fkn dynamite. This guy is on the ball with the passive gospel and flows dominating returns. This has been the case with flows dominating country performance on a macro scale interesting to see how this global trend has taken over US public markets. The effects of regulation, technological trends and mass psychology on steroids = the QQQ’s of today. Very good. Would like to have Mike appear more frequently. Thank you. Great conversation. Appreciated Michael's plain honesty and delivery style! The index funds and ETFs will be the subject matter of the next Wall Street debacle. I think Michael is right about ETFs and index funds climbing higher, but eventually the same dynamic that's pushing grossly overvalued companies to the moon will work in reverse. Tracking error will be an understatement. I could see some lesser known names with a zero bid when ETF/index owners suddenly get into a selling mood. Short sellers and active managers with cash once filled this gap. In their absence, who will be buying? Michael left me with a lot to think about. While he is bullish on tech currently I am wondering when he will pull the plug, or if he will pull the plug. The enthusiasm for tech reminds me a lot of 1999. Really liked it - very entertaining guy and he provided some very useful info and background. Thanks Michael and Brian! - "A thing called a hedge fund" - those places don't exist anymore? 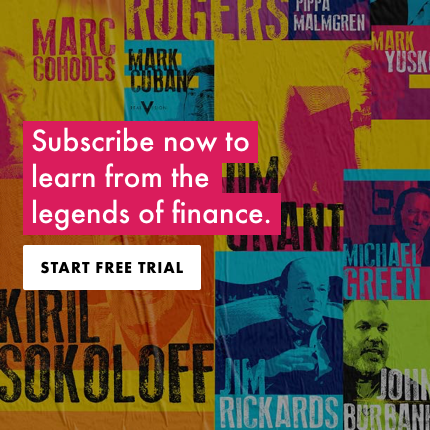 - There is an entire fantastic masterclass about ETFs with Steve Bregman on RV, much better perspective on the matter - On diversification and bonds, if we get inflation this risk-parity trade won't work (see Gave on Macrovoices). - Then saying "maybe (approx. x10 times) you should diversify in A-B-C-D" before recommending to buy tech in an ETF. Really? This is a recommendation? - "EM is scaring me" - any substance? This lack of substance/nuance and arrogance really made me not enjoy the interview. Sorry you didn't enjoy but relax, my friend. Exhale. It's all about offering a wide variety of compelling views amid a wide variety of presentation styles. Thank you for watching and for offering your views. Was initially a bit pissed that this wasn’t a trade recommendation and somewhat rambling but Brian is right, let’s just relax. So what if it wasn’t a precise trade recc, the context was insightful and quite a few interesting things were touched upon, so a good use of time after all. Tech ETF to take advantage of the structural momentum. Commodities and real estate as an inflation hedge. Scared of EM due to China meddling with the Yuan. You're comment is more indicative of your listening skills and inherent biases than this interview. Sounds like this guy has been losing money for a while. Maybe he should take his own advice and buy EM as the dollar starts to turn back down any minute now. Tech has been in a text book secular uptrend; what gives you the impression that he's been shorting tech? Great interview, Michael’s stories and narratives are not only informative, they are entertaining too. Really looking forward to hear more from him in the future. I also think Brian is a great interviewer, asking a question or two, sitting back and letting Michael run with his narrative, and then compacts Michael’s views into a few key sentences for the viewer.